Hi! Just as I was preparing for the Amakusa 24 hour cirucit, looking forward to weather conditions that were predicted (and later vindicated) to be the best I'd ever seen, word came (wouldn't you know it) that a tsunami due to the South American earhquake was to hit the area on the evening of Feb. 28th local time. I'll make a detailed post of the circumnavigation itself soon, but since a few of you have expressed curiosity about whether I saw anything out of the ordinary, or if the currents I relied on were noticeably affected by the tsunami, I'll cover this little subplot first. Anyway, your requests aroused my curiosity too, so here are the results of my research and ruminations about things tsunami. Being the kind of person I am, I was not to be deterred by a tidal wave during my record attempt. The way I figured it, I would be on the inland seas when the potential tsunami was due to arrive, and although semi-enclosed bodies of water are sometimes particularly vulnerable (from the japanese: 'tsu' meaning inlet and 'nami' meaning wave), one look at a map of our corner of the world will show that the waters in question, with their narrow entrances opening to relatively large and landlocked water areas, were not the kind of inlets that would amplify waves: in fact, I expected the opposite to happen. 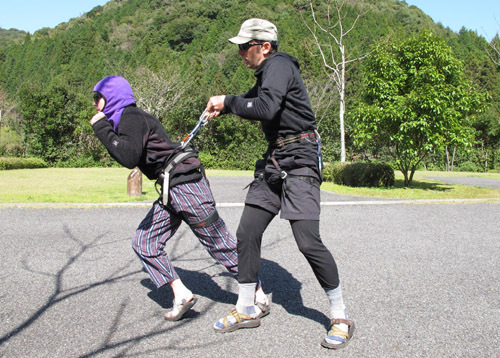 The Japanese authorities, infamous for exaggerating any potentially hazardous condition, estimated the height of the tsunami at 1 meter on the open Pacific coast. By the time it wrapped around Kyushu and entered through the straits, I expected that it would be attenuated to maybe 30cm at worst. This kind of wave I could handle. Furthermore, a tsunami is only dangerous near the coast and over shallows, and a suspicious drop in water level usually precedes it, so if I happened to be paddling near shore I'd be forewarned and take evasive action. Famous last words? It was turning out to be an exceptionally calm day as I began my circuit at noon on the last day of February. By late afternoon the sea was smooth as a mirror and, perhaps because of the tsunami warnings, there were very few fishing boats about, making the sea very quiet and peaceful. This said, from several directions at once on or near the distant shores I could clearly hear a constant cacophony of warning announcements from public loudspeakers, itinerant fire trucks, and various coast guard vessels. I gathered they were predicting the wave for between 5:30 and 8:30pm. 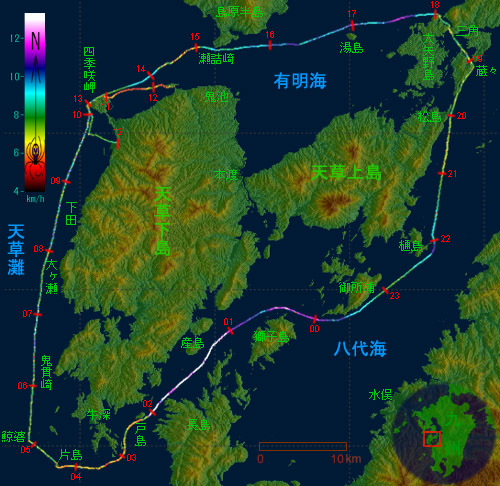 The coast guard presence was heavy as entered the narrow Misumi Strait. As luck would have it, the first few patrol ships passed unawares of my presence but I was sure to be noticed in such a confined area. The sun was just setting and I suddenly wished darkness would descend faster. Incidentally, about this time I saw some children playing on a filthy beach, under the watchful eye of their guardians, no less, even as the din of the PA filled the air with news of impending watery doom. Go figure. Presently, just as I was making my final exit from the busy fairway, I was intercepted by the biggest of the coast guard cutters. 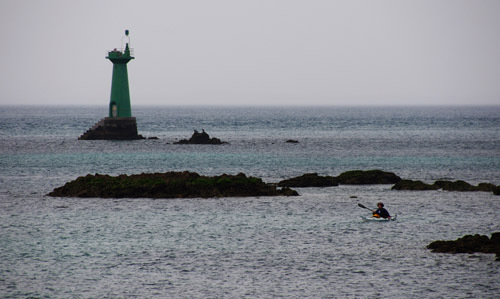 Surprisingly though, they were more concerned about the dangers of paddling at night than the tsunami, and suggested I strike camp on one of the nearby uninhabited islets. 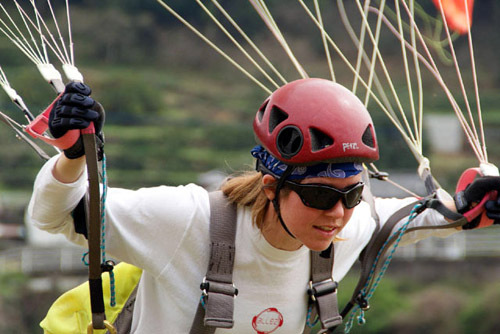 They recommended I camp as high as possible, but still this advice struck me as a bit dubious. 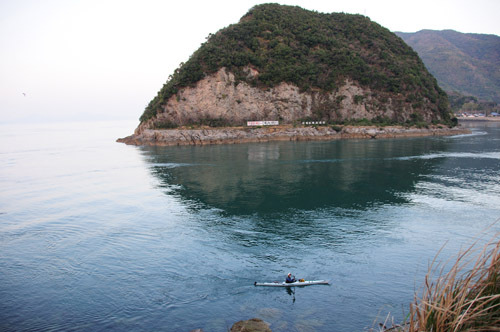 Of course, ignoring the coast guard's commendations, I paddled out onto the Yatsushiro sea a short while later. A stunning, rising full moon was reflecting brightly in the mirror-like sea, bathing the quiet night scene in beautiful light. Now there were absolutely no boats out except for said coast guard vessel which had dropped anchor in the middle of the sound kilometers from shore - a wise move, I suppose. Somehow, though the tsunami was still impending, the veil of darkness was enough to silence the PA announcements, and with not a breath of wind, the stillness of the evening was absolute. At 7:26 pm, I was heading south several hundred meters clear of the shore of Iwa-jima island. Because the tide had not changed yet, my plan called for hugging this shore to minimize the effects of a slight unfavorable current, but just then I was cutting short across the mouth of a small, open bay. Then, a small rushing noise similar to a ship's wake breaking on the shore disturbed the silence of the night. 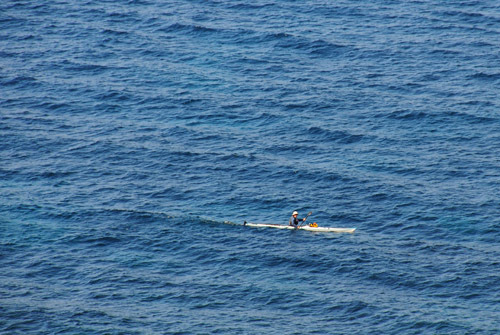 The mirror of the sea began warping ever so slightly, and my kayak yawed almost imperceptibly. It could very well have been a wake from a distant freighter; under these conditions wakes can be felt for many kilometers. Had it not been so perfectly calm, I would not have noticed any of this. Coming closer to shore minutes later, I could see in the moonlight that the wave had been so slight the gravel on the gently sloping shore was barely wet. Was this the tsunami? So last night, I delved into the available data. 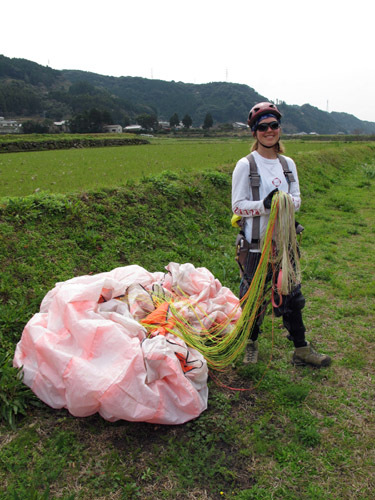 Just for geeks like me, Japan has one of the densest networks of continuously reporting tidal stations in the world, and these provided me with all the information I needed for a forensic tsunami investigation. My initial look at the data revealed a surprising fact: days after the quake, the Pacific is still sloshing about like the swimming pool after Tony Soprano's cannonball (sorry). Judging by the slow decay of the waves, this ought to continue for the rest of the week. I really didn't know tsunami waves attenuate so slowly; normal waves are not nearly as long-lived. A tidal deviation graph showing several days of recorded data at Miyazaki. The arrival of the tsunami is obvious, as is the subsequent, long term rippling of the ocean. Anyway, according to these data, the very first wave hit the east Kyushu coast at Miyazaki just after 4pm, reaching 80cm of height a few hours later. (So, after all, the Japanese predictions weren't so conservative, and at nearby Shibushi Bay the 1 meter mark was in fact reached.) The southwest corner of Kyushu at Makurazaki measured the first wave at around 4:30, and by 5:30 it was at Akune near the southern entrances to our inland sounds. The northwest entrance at Kuchinotsu recorded the wave at 6:30, where it manifested iself as a 20cm drop in water level for more than an hour. Moving inland, the wave eventually reached Oura, the most inland station, at around 8pm. A map of Kyushu showing the locations described above. The red X marks the spot where I was when I felt the tsunami. How fast does a tsunami move, anyway? Well, its speed depends on the depth of the water, so to answer this question accurately, you need a detailed computer model of the relevant wave equations combined with data about the sea bottom. However, we can make a rough calculation. The useful equation is the deceptively simple shallow water equation, v^2=gd, where g=9.8m/s^2 is the acceleration due to gravity of the Earth. (Check out also a kind-of cool animated graphic on Wikipedia. )What is meant by 'shallow' here is the depth of the water relative to the wavelength, and tsunamis have long wavelengths of many kilometers, so to them, even the deep oceans are 'shallow'. To put it another way, while even storm waves affect only the surface layers of seas, a tsunami moves the entire body of the ocean. The wave constantly 'feels' the friction of the sea bottom. So the shallower the sea, the slower the wave moves. Although usually less than a meter high in mid-ocean, this slowing down as it approaches the shore is what causes the tsunami to 'pile up' and reach destructive size. Anyhow, in our case it seemed to move from Makurazaki to Kuchinotsu, a distance of about 180km, in about 2 hours, giving a speed of 25m/s. 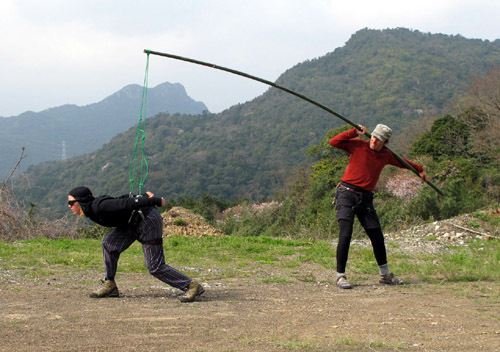 Plugging this into the trusty formula, we get a depth of 64 meters. And gosh-darnit, if that ain't about the average depth of the offshore seas on the west side of Kyushu, according to our sea charts. 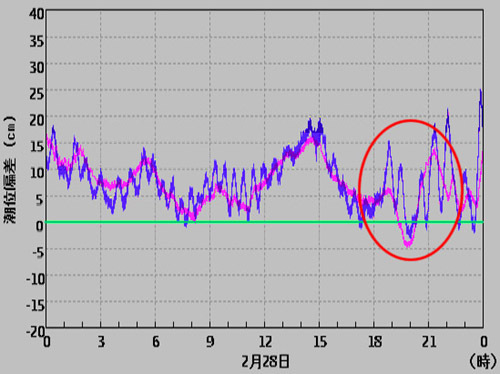 Graph showing sea level deviations for Yatsushiro (blue) and Misumi (magenta) around the time of the tsunami (circled). Evidently the tsunami made the water level difference between Yatsushiro and Misumi slightly higher than normal. A stronger current towards Misumi could therefore be expected. But I digress! Here is the relevant graph for Yatsushiro port, from which I was only seven kilometers distant at 19:26 on the night of the crime. This actually depicts the measured tide minus the predicted tide; that is, the so-called tidal deviation. Most of the irregular peaks and valleys here are caused by changes in atmospheric pressure, but there is also a semi-regular 'sloshing' motion every 30 minutes or so. This is normal for a confined body of water and is called 'seiching'. When the tsunami hit, the seiching became much more pronounced and 19:26 corresponds exactly to the crest of a wave (about 10cm high). So things seem about right, although the timing of the seiching is local and could have been different at my location. 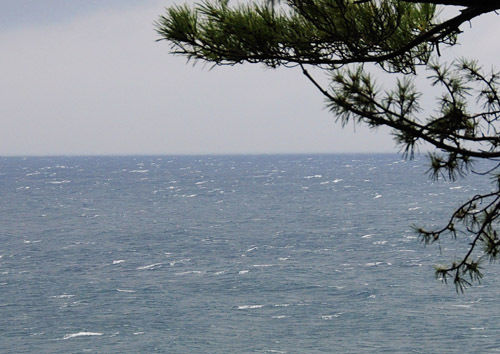 Yet it is possible that somewhere in the shallow Yatsushiro sea these waves broke and generated the ripples I experienced. The next question is, did I feel any strange currents? 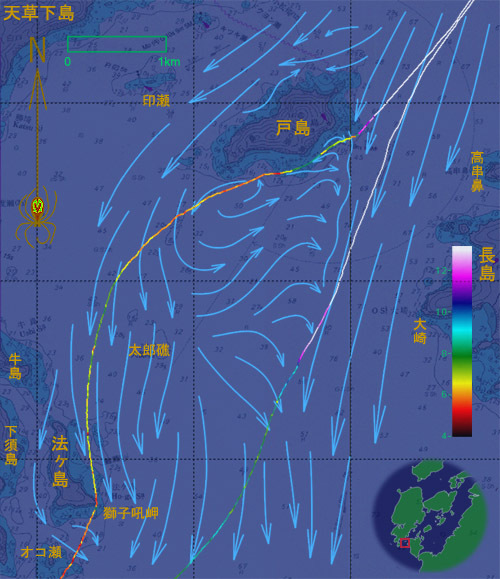 Perhaps the best way to see this is by looking at my track speeds passing through the Misumi and Zozo Straits, which is when the first waves were recorded by the tide meters. I did not notice anything strange at the time, but also plotting the speeds for my 2007 March 21st circuit, which had almost the same timing relative to the tide (passing Zozo point 1h 9min and 1h20min before local high tide respectively), any funny differences in currents should show up as differences in my speed. Both times, a slight current working against me was predicted and also experienced. 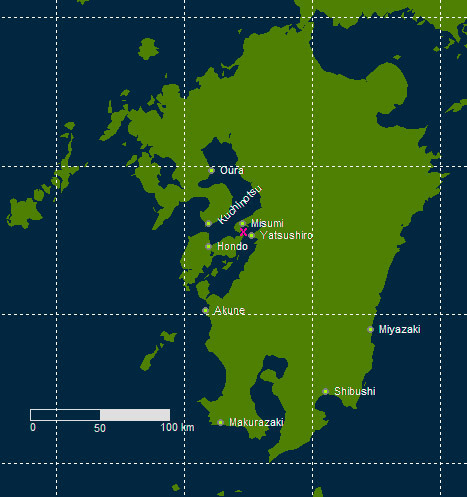 Also plotted are the tidal deviations for Yatsushiro and Misumi. (Note that Misumi has no significant seiche.) Ignoring the seiche that is probably local at Yatsushiro anyway, the general effect of the tsunami was to make the Yatsushiro sea level about 5cm higher than normal, relative to Misumi. 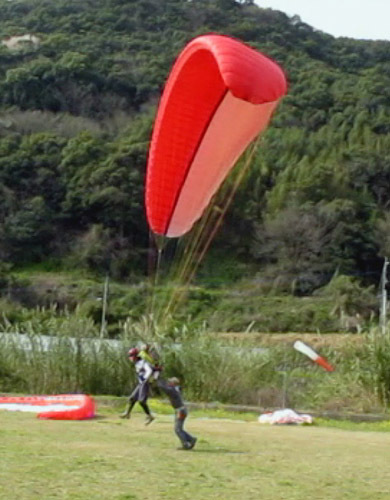 This would have strenghtened the current somewhat, resulting in slower kayak speed. Did it happen? Well, yes! 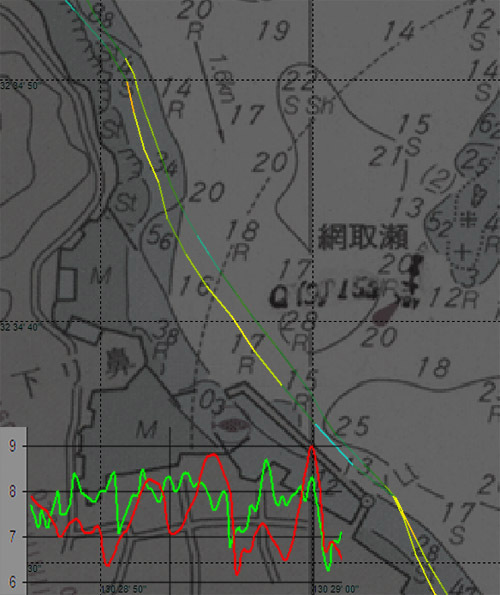 In spite of the record time I was about to set, last weekend saw me going through the Zozo Strait slower than normal. 27 seconds slower, in fact. Here is a diagram of my passage through the Zozo Strait. Two tracks are shown. The one from last weekend is generally the one more on the left. The other one is from March 2007. The tracks are color-coded according to speed; yellow to orange means slower and green to blue means faster. You can see that in this section, last weekend's transit was slower. Also on the lower left is a graph of the speeds against distance. This graph also shows that for the most part, the speed during the current transit (in red) was slower than the 2007 trial (in green). All this seems to indicate that the current against me was faster this time around, as would be expected from the analysis of the tsunami data. So there you have it. The tsunami made itself felt. Just barely. I would have never known if it hadn't been so calm and if I hadn't done all this investigating. And if you somehow made it in reading this far, now you know too. We are home safe and sound after an overwhelmingly successful circumnavigation of the entire Amakusa archipelago, plus an addtional 15km or so to make more than 100 nautical miles (185.2km) in under 24 hours. This also sets a new record for the circumnavigation of Amakusa (175km) in just over 21 hours, shaving more than two hours (!) off the previous record. The final part of the journey was completed in stormy conditions with 25knot wind, 2m waves, and a scary lightning storm which forced Rik to seek refuge on shore and lose precious time. Despite this 30 minute delay, he was still able to complete the 100 mile project successfully. The circumnavigation itself was completed without interruption in the nick of time before the lightning started, and Rik figures the overall conditions were so perfect it is unlikely a significantly faster time can be achieved: the circuit average speed was about 8.4km/h. Congratulations to the CANADIAN men`s hockey team on winning GOLD. First of all, for all those concerned about the tsunami predictions in Japan, officially on February 28 at 23:46 the tsunami warnings were cancelled. 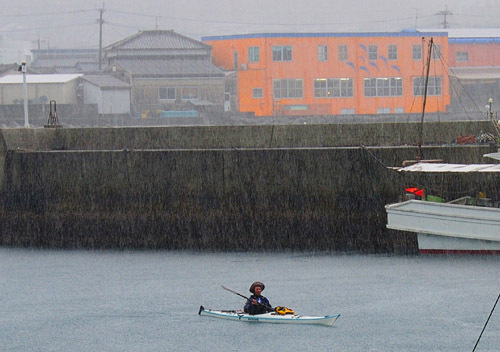 Around 6pm a small cheering squad greeted Rik as he passed through the narrow strait 46km into the trip. 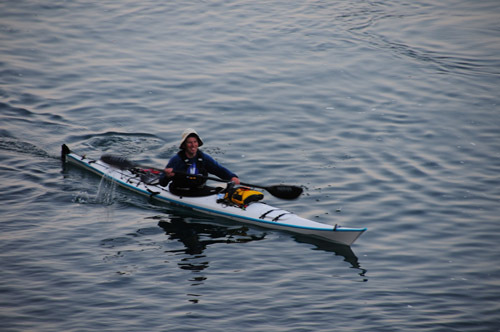 Here is the happy guy as he avoids a slight head current by hugging the shore in the glass-calm Misumi Strait at sunset. Currently（2:25am）at the Shikizaki-Misaki light house, the wind was recorded as 4m/s from the south. As Rik is just about to pass the south point of his route, it looks like he will be cruising on a tail wind soon! Now he will just have to battle against the lack of sleep, tired muscles and the monotony of pushing the paddle through the water one painful stroke after another. Follow Rik at SPOT. GO CANADA GO!!!! GOLD IN MEN`S HOCKEY!! !